People often used nicknames in the dale where Bill Alderson lived, so he was also known as Big Bill of Angram or ‘Bill Up t’Steps’. It was said that if you addressed a letter to ‘Bill Up t’Steps, Yorkshire, England’, the postman would be able to find him! 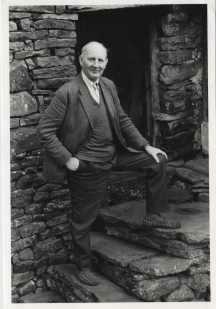 Big Bill grew up on an 80 acre farm in Angram, Upper Swaledale, where he lived with his mother and father (who was also known as ‘Bill Up t’Steps’) and his six brothers and sisters. As a boy he helped his father on the farm after school, learning to milk the cows and mow the fields at haytime using a scythe. Big Bill believed that he learnt more at school than they do today, “we learned a bit o’common sense,” he said! He started school at five years old and would walk the one and a half miles into Keld over the fields. The highlight of the Alderson family’s year was Whit Tuesday when they would travel by horse and trap to Hawes but as Bill got older he also loved to travel to Reeth Show by push-bike. On these special days he would always have a little bit of money in his pocket which he’d made from catching and selling rabbits. Big Bill grew up to be over six feet tall and was well built too—which could have been from starting each day off with a big bowl of porridge like his father.